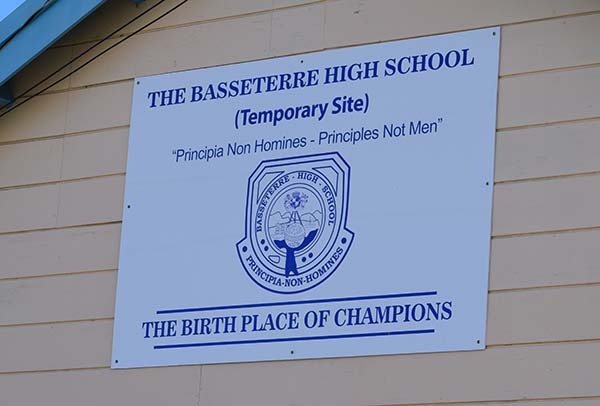 Basseterre, St. Kitts – The ideas for the new Basseterre High School facility put forward by the government will see the construction of a state-of-the-art and modern facility to educate almost 1,000 future students. Minister of Education Shawn Richards said at a press conference last week that the government has estimated a cost of approximately $40million for the new school. Richards added that a committee of experts had been charged with the responsibility of identifying what the school would be comprised of. He then gave some of the amenities put forward by the committee to be included in the school: “The committee determined that in terms of classroom spaces, [we needed] five rooms for mathematics, five rooms for English, five rooms for geography, four rooms for social studies, four rooms for history, two rooms for language labs, two for principals of business, two for pincipals of accounting and two rooms for art,” he said. “Each room [needs to have] two doors on different sides of the classroom. A counselling centre with a waiting area, nurse quarters, library, media centre, security room, cafeteria, swimming pool, cricket pitch, football field and 400m track are all other facilities put forwad by the committee. Richards, however, indicated that some of the items proposed may not be included in the actual design, due to budget restrictions. Construction of the school could begin as early as later this year and could take up to two years to complete.